Many tech companies approach the market brimming with pride over their new product. Their new offering represents the bleeding edge of technology harnessed with the most impressive engineering. But far too often, their new product is just that – a product. Even worse, their new product is really technology looking for a market and not at all a solution to existing pain points customers are suffering from daily in the field. THE SITUATION COULD NOT BE MORE OPPOSITE WITH ZIIPROOM. BORN DIRECTLY FROM ACUTE END-USER FRUSTRATION, ZIIPROOM WAS CONCEIVED IN THE FIELD BY SUFFERING END USERS. In 2016, Martin Bodley, ZiipRoom CEO and co-founder (and prior CEO/founder of RevoLabs which was acquired Yamaha), was contacted by a colleague who was responsible for nearly 7,000 rooms globally for a Fortune 250 pharmaceutical company. Bodley picked up the gauntlet and assembled a small core team of experts with well more than 100 years of collaboration, wireless and mobility expertise between them. Eighteen months later, they annouced ZiipRoom, the only software purpose-built to connect people and technology to make every meeting experience consistent, simple, productive and free from vendor lock-in. ZiipRoom is a software subscription offering that complements what’s already in the room. 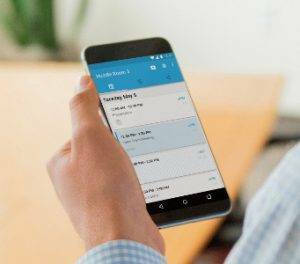 With patented software on BYO devices (Android, iOS, Windows), in the meeting space, and in the cloud, ZiipRoom knows users, their locations and the devices they’re carrying. 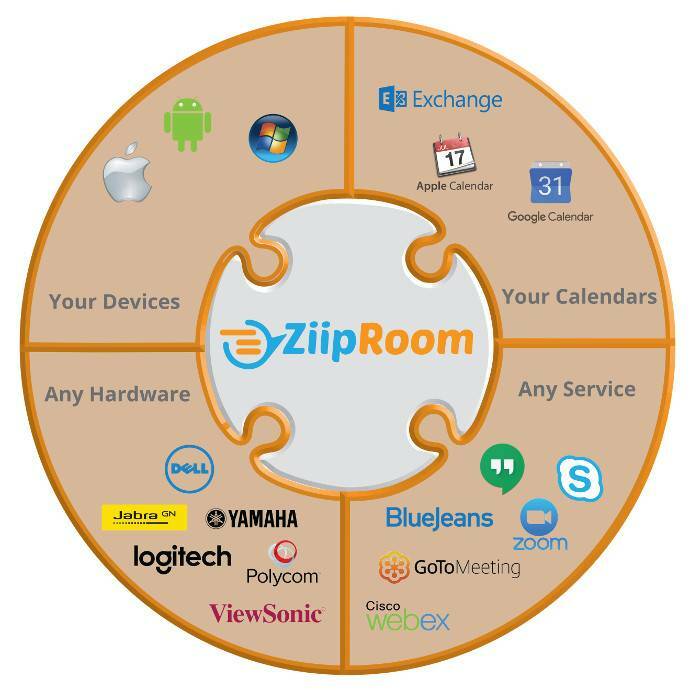 Within seconds, ZiipRoom’s intelligent software scans users’ calendars (and the calendar for the room) and shares click-to-join buttons to start any scheduled VoIP or UC Video meeting or share wireless presentations directly from their device of choice. Since emerging from ‘stealth mode’ at InfoComm 2018 in Las Vegas in June, the ZiipRoom team has been busy finalizing software for release in Q4, executing pilots and demonstrations with future customers, and even garnering a couple awards. The team has also been actively completing go-to-market plans and aligning reseller and distribution partners. 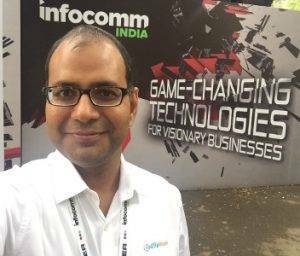 Roshan Gupta, ZiipRoom’s Regional Director for India Region interacted with many AV channel partners during InfoComm India 2018, and their most common response was very simple yet very profound: ZiipRoom solves long-suffered problems for end users and uniquely fills a market gap. ZiipRoom complements the solutions many vendors are selling for VoIP, UC Video and the A/V hardware in meeting spaces (monitors, cameras, speakerphones without competing against any of them. This allows resellers to easily add ZiipRoom software benefits without complicating room design or alienating existing solution providers. And, at just $299 per room per year (apps are free for as many users and devices as desired), ZiipRoom brings long-sought simplicity and consistency that’s the core driver of user adoption which, in turn, drives higher customer ROI. That said, the largest opportunity ZiipRoom brings for partners is the missing opportunity between the 250 rooms that have been deployed and the remainder of the 7,000 (like the challenge facing the global Pharma organization mentioned above). Roopam Jain’s (Frost & Sullivan) recent blog, Huddle-room Collaboration – Looking Beyond the Hype, indicated there are now over 32 million huddle rooms worldwide, but only 2% of them are video enabled. MORE IMPORTANTLY, JAIN SHARED THAT HUDDLE ROOM UTILIZATION FOR VIDEO CALLS WOULD EXPLODE, GROWING EXPONENTIALLY FROM JUST 8.1% OF VIDEO CALLS TODAY TO 70% OF ALL VIDEO CONFERENCING ROOM MEETINGS BY 2022. If you’re an AV/IT reseller looking for business expansion, which market opportunities are anticipated to have such a promising CAGR? 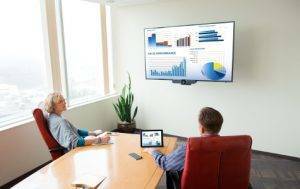 Ensuring that every meeting experience is simple, consistent and productive goes a long way in creating satisfied customers and securing future orders for ZiipRoom software – and all the A/V gear in the rooms as well. And, with the insightful data and analytics from the ZiipRoom cloud portal, channel partners can leverage ZiipRoom to provide enhanced services to the many collaboration spaces that were once just too costly to reach with high-end, white glove type services. ZiipRoom may be a small startup, but their impact looks to be much larger. For a link to the online article, click here.